Corner of Davie and McDowell Street, December 2016. 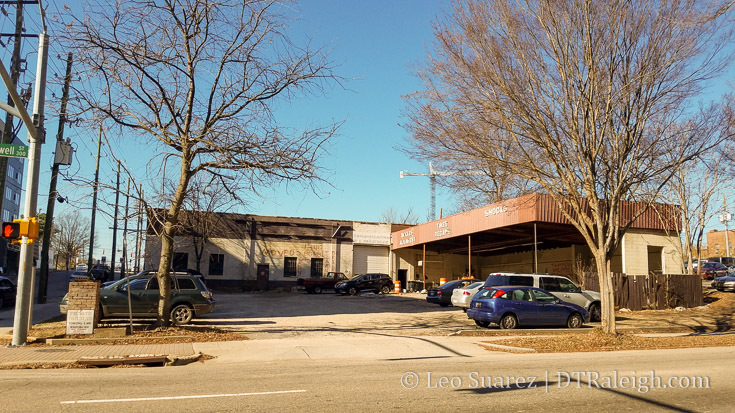 Revisiting a topic we talked about in May 2015, new site plans for a hotel at the corner of Davie and McDowell Streets popped up at the city recently. As always, here’s the site plan map for your viewing pleasure. 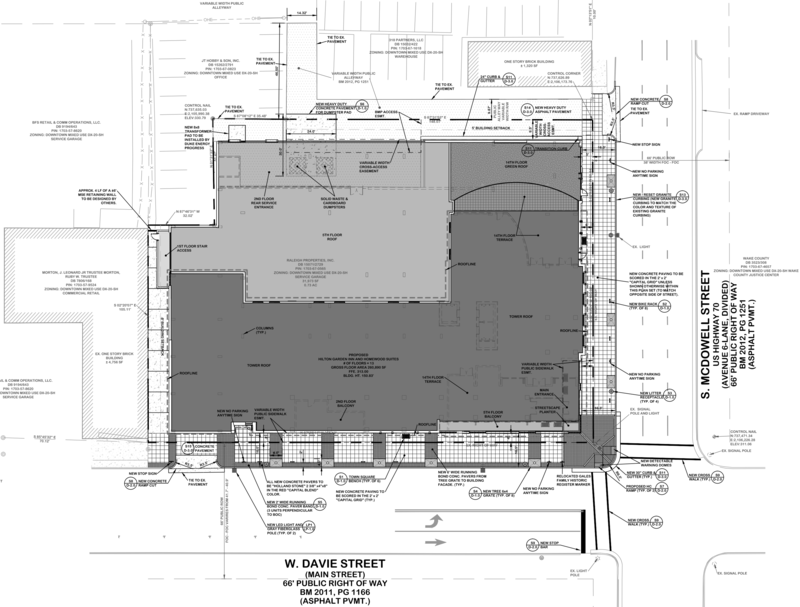 The site plan doesn’t indicate any ground-floor retail. I’m not saying there won’t be any; it’s just that this plan doesn’t show it. The parking garage entrance would be along Davie Street indicated by the driveway in the plan. I also spotted some outdoor spaces. The 14th floor will have a terrace in addition to a 2nd and 5th floor balconies. One key detail to note is that the former Morton Trophy portion of the area is not part of this development. 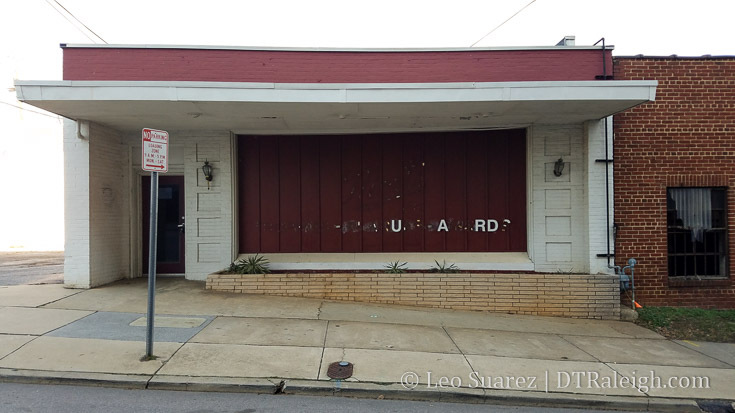 It’s predominantly the Turn Key Tire station, the red brick building that will be demolished to make way for this new hotel. I also want to guess, seriously just a guess, that the “delay” in this project comes as a result in the council changing the required amount of parking for hotels in the downtown area. You can revisit that topic here but in short, the required amount of parking for hotels was reduced in early 2016 from 1 space per hotel room to 1 space for every 2 hotel rooms. That sounds like incentive enough to rethink some development plans. We’ll keep on eye on this one as it progresses. Sigh……..not bad I guess but that’s one of the most promising available lots for a real skyscraper. Why is everyone afraid to go vertical? In my mind, 13 stories on this tight little corner is very much going vertical. Between hotel developers being a cautious bunch, and this site sort of being on the edge of a gulch, 13 is about as good you could hope for here in 2016/2017. Several years ago, we were begging for hotel rooms to complement our new convention center. Now we are lamenting a hotel project only being 13 floors. Progress…. Well……I guess its a start.can’t understand why you wont build any taller than 13 stories tall. ????? but you need hotels around Downtown so i only hope that one day they build a Hotel more than 20 stories tall. I don’t really care about the height, what absolutely kills me about this is that they apparently did away with the rounded glass corner. That was seriously the ONLY thing about the initial render that gave it any sort of visual flair. Besides that, it was just a box – but a box with a neat, rounded glass corner. Now it will just be a box. Like everything else. I guess it must have to do with the fact that they’re confined to such a tight corner, so by taking away the rounded corner, they can fit more floor space. No vision. Hotels are businesses and businesses have to make money. This means that the quality of design is intrinsically tied to the ability of the property to make money or increase their brand identity. Does Raleigh really offer a hotel either that would justify the designs we want? One of the aces that Raleigh can play when attracting business and conventions is that costs of doing businesses and business travel here are lower. This means that hotel rooms aren’t going to command $300+ a night for rooms which means that hotels can’t afford the magnificent architecture we all crave. It’s an economic no-win for those who love good design. The pressure on design only gets worse as land values increase. Now the hotel developer has to overcome higher land costs in a “value” market. One might think that going higher would help defray the costs of land but the hoteliers also have to consider demand for the rooms. Likewise, we cannot expect good civic design either as long as “we” stay stuck in the “all taxes are bad” mindset that has anchored itself into the American psyche and narrative the last few decades. I don’t know why people in Raleigh think there is going to be a tall tower built here. If you look at since 1991 there have really only been two skyline changers built downtown: The Red Hat Tower and PNC Plaza. Maybe you can count the Skyhouse Tower too but really only because of it’s location. And let’s not forget all the construction in “Midtown” (LoL, too funny). Folks if you want to see high rise construction go to another city. A real major city: Atlanta, Miami, Houston, Dallas… heck even Charlotte. There won’t be any real skyscrapers here, ever! Its a shame…just a shame. lol raleigh. @bryan I think you are wrong when you say “ever”. It may be a decade or two but Raleigh may be as large as Charlotte or even Atlanta one day in the distant future. Raleigh is projected to hit 700,000 residents in the 2030’s, which would make us similar to Denver or Seattle. Even excluding the Space Needle, and admitting that RTP will still be the regional jobs center, I can’t imagine the skyline will lack any “real” skyscrapers. My take is that the downtown Raleigh boundary has substantial barriers limiting sprawl which will force development to go tall sooner than some might think. Established residential to east, southeast, and west, the MLK/Western blvd overpass (that we all so love) to the south, a narrow corridor to the north constricted by residential on each side. With so many available lots in core now being claimed by medium height projects I don’t think the day is that far off when downtown starts going vertical. Yes, North Hills will compete for a time but this area is also constricted, not just in terms of space but also when it comes to transportation capacity. With bus terminals, train station, etc. downtown has the advantage over time. Adding to Stew’s thought, I think a parking deck or two could be removed for a larger tower in the next ten years or so also…the Sheraton and Two Hannover decks come to mind. The height cheerleading continues to dumbfound me. Do you guys think people just have some extra 10’s of millions laying around they can sink into a building entirely on spec so your SimCity fantasy can come true? Downtown is growing steadily and in a healthy manner. My dad was a Park Ranger at the Grand Canyon long ago. One day a visitor remarked that the Canyon must have made a very loud sound when it popped open one day. Thinking the visitor was surely joking, he came back with “oh yeah…imagine how loud it’ll sound when it slams shut!”. The visitor was not amused. You do not want Miami or Abu Dhabi here. Raleigh is doing just fine…better than fine I’d say. I think “ever” is such a negative term to use,in the way that Raleigh is growning, it maybe a few years for another tall tower to be built downtown. 20,30, or even 40 who’s to say. Raleigh is not Charlotte or Atlanta and Raleigh doesn’t need to be. Raleigh is a City that will Shock all and go….WOW.!!! @Josh — Raleigh will NEVER be as big as Atlanta. As Raleigh grows Atlanta grows at or above the same rate. The growth will be stunted because of having Durham right next door. It will always be Raleigh/Durham. @Maverick — ever IS a negative term but unfortunately it’s more of the truth than anything. Look, Raleigh is DEFINITELY growing that’s not the question. But we are talking skyscrapers here. I grew up in Raleigh so I’ve seen it change but I’ve also seen only TWO… that’s 2… T.. W.. O.. “skyscrapers” built. I love that Raleigh is growing. I have plenty of family and friends still there, which is why I even follow this blog. The fact remains there isn’t going to ever be any real high rise construction nor will Raleigh grow to be this great city that everyone keeps talking about. A nice place to live, yes but that’s it. That’s why I left and went to a REAL city in Atlanta. Atlanta has completed 5-6 buildings over 20 stories in the last year plus there are about 10 under construction now. That’s not including the bouildings announced for early 2017 (4 that I can think of) or the many proposals, including a 74 story building. Again, it’s wonderful Raleigh is growing but it’s skyline will never be much more than what it is unfortunately. You guys are talking a decade, up to 40 years for ONE more “high rise” to be built!! It’s almost been a decade since the PNC building was built. So you mean another 10-40 years?!?! My point is that I have read a lot of people complain that Raleigh won’t go higher but it won’t. Raleigh shouldn’t expect anything over 20 stories unless it’s a GRAND proposal of a 30 story tower. Just be happy that there are some buildings over 10 stories being built. I’ll just enjoy the skylines of downtown, Midtown, Buckhead, Atlantic Station, Perimeter, and Cumberland, all except for Cumberland have taller buildings than downtown Raleigh. You left Raleigh to move to Atlanta because they have more tall buildings? That’s even more sad after I read that back to myself. I’ve been to Atlanta more times than I can count and enjoy visiting but you can keep all filth and ghettos, I’ll take Raleigh any day of the week. There’s a reason Raleigh ranks at the top of every “Best places to live” list. Most people care alot more about quality of life, low crime rates and growing economy than how many tall buildings we built this year and how many we have planned. (clapping hands) Wow Daniel. I’m from (NYC) and moved to Raleigh 14 years ago, never looking back. Over that time have seen Raleigh blossom and grow. those that post comments here on having more high rises and tall buildings in downtown Raleigh some good and not so good comments,are fine, BUT, whatever developments come to downtown Raleigh we can only embrace it and welcome any development that will change the face of the City and the County forever. We are in the 21st Century not the 20th, we can only look forward to the future not nag about it. transit, the Homeless, north hills, whatever. We have every right to post comments here so as long as we do not disrespect those that live in this city, including the homeless. Raleigh is indeed growing and will continue to grow, so long as we grow….TOGETHER. The comparisons to Atlanta are somewhat misplaced. Just some things to keep in mind, 1. I think we all understand that Raleigh will never catch Atlanta in size, but the point was that Raleigh may eventually be like Atlanta is now. 2. The comparison of the ATL skyline with Raleigh’s is kind of silly, remember Atlanta is bigger than the Triangle and Charlotte put together (Metro Atlanta has around 5 million people and NC’s two biggest metros combine to be about 4 million). Also, Bryan, skyscrapers tend to come in waves, right now there’s a lot of resistance among certain people downtown to big buildings, but once the first 500+ foot building is built off of Fayetteville St, others will probably follow quickly. Downtown will probably look more like Denver or Minneapolis, rather than a huge metropolis like Atlanta, but the idea that it will be limited to 20-story buildings seems unlikely. Raleigh wants to be the Arts Capital of the South. Instead of focusing on height, let’s focus on the quality of architecture that’s being built. More Dillons and less Skyhouses. Unique architecture will promote tourism and growth. What say you? Raleigh is not a transportation hub or manufacturing center. We are growing for different reasons compared to Atlanta. Raleigh continues to double in size every 15 yrs off of charm alone. RTP is our honey pot and it’s closer to Durham. I don’t get the Arts Capital thing. What arts? Capital? Surely there’s more art in the South than CAM and some galleries. The arts refers to more than just physical art work in museums and galleries, it’s also performance arts like the symphony and ballet. it’s live music festivals and venues. it’s grassroots public art programs and arts education. It’s poetry and literature. It’s culture and culinary. I think that Raleigh is doing just fine and its vision toward being an arts capital is spot on in my opinion. I’m not worried about towers; I’m concerned about experiences. Those are the things that matter and arts of all kinds give us experiences. The things that excite me are things like the Morgan Street Food Hall and sustaining/expanding on our annual festivals. I’ll take that over a postcard ready skyline every day of the week. I don’t want Raleigh to become anything like Atlanta is now. If it does then it’s completely lost its charm. Atlanta is fun to visit (I’m a Braves fan) but that’s where it ends for me. If Raleigh ever even resembles what Atlanta is now, I’m gettin out. I do think a couple more tall buildings would be nice from a skyline perspective. Afterall, the skyline is the face of the city. Having a growing, vibrant downtown where more people live and work and shop is always a good thing but like I said earlier, you can keep the filth, crime, ghettos and traffic that “big” cities bring with it. I am from Raleigh & have lived here 68 years except for 4 years , Army / College , & I may not see this happen in our downtown during my lifetime . I would like to see 10 more high rise towers in our downtown area that are between 20 to 40 stories ! What a skyline that would make ! @ Daniel — that was just dumb; I left Raleigh for more tall buildings? No, I left Raleigh because it’s boring as hell. Plus I got a great job opportunity that puts me just under a six figure salary. I thought we were talking about skyscrapers but since you took it somewhere else that made no sense then we’ll just go there. Raleigh is a great place to go to college and leave or raise a family in a boring suburban life. Sorry, I wanted more excitement. Raleigh is a big town not a real city. And yes some of my choices in possible relocation areas did have to do with the beauty of the city and its skyline. Some people like the view of mountains, some people like the view of the ocean, I happen to love a beautiful skyline. And what filth and ghettos do you refer too? Atlanta has torn down ALL of it’s housing projects and most have already been redeveloped into mixed use and mixed income communities. Unless you spent all your time in Vine City or Bankhead your statement makes no sense. Nobody visits Atlanta and stays in the hood and I’m sure being an out of towner you didn’t make your way to those areas. And being from Raleigh I know of plenty of ghetto and filthy places there: Raleigh North HOUSING PROJECTS (ATL doesn’t have those), parts of New Bern Ave, parts of Poole Rd, Garner Rd, Rush St, MLK Blvd, Blount/Person Sts., Bragg St, Illeagnes Rd, Carolina Pines Ave, Rock Quarry Rd, part of the Capital Blvd area… need I continue? Just remember Raleigh will NEVER be like Atlanta. And folks like you that love the “quality of life” will continue to come to big cities for your entertainment. The beauty of here is that I can have the same quality of life (ITP or OTP) and the excitement of the big city all in one. In Raleigh you can’t have that which is why I made sure I relocated. You want Raleigh to grow but you want the charm to stay? You want a more vibrant place but you don’t want the “filth, crime, ghettos and traffic that “big” cities bring with it?” Sounds like you want Raleigh to grow but you don’t want Raleigh to grow past a certain point, which won’t happen with growth of a city. Exactly the mindset of people that made me push so hard to get out of that town and I’ve been blessed to come to the Capital of the South! @ Steve — Sorry, Raleigh will NEVER be what Atlanta is without being as big as Atlanta. The reason why Atlanta this the great city is because of it’s size. How could a smaller city ever have what a big city has? Atlanta will never have what New York has because of it’s size. Unless Atlanta grows to be the size of New York there would be no need to have as much as New York. My whole point was is that people in Raleigh want taller buildings and it’s not going to happen. The comparison was to say bigger cities get taller buildings in most cases. A 30 story building in a town like Raleigh would be a game changer where a 30 building in Atlanta is common place. And you said skyscrapers come in waves but where is the Raleigh wave? I stated that since 1991 there have only been two “skyscrapers” built in Raleigh. Even if you included North Hills aka Midtown Raleigh (sarcastic face as I type this) that’s still only four that have been build in the city as a whole since 1991. That’s 25 years!! What kind of wave is that?! So the fact that you mention that there one day maybe a cluster of 500 feet towers when there has only been ONE built and nothing is even being proposed doesn’t make sense to me. Plus comparing Raleigh’s skyline or even the thought that it may be like Denver’s or Minneapolis’ is ridiculous; those are “big cities” and Raleigh will never be nothing more than a big town. I hope all the Raleigh folks enjoy you 13 story proposals in your big town. Enjoy your “quality of life” and charm in the capital city of North Carolina. I’ll continue to enjoy the 30 plus buildings that are built here all the time (aawww Raleigh wants one LoL), my just as good quality of life, charm, history of Atlanta, legacy, fun, excitement, entertainment, world class events and conventions, better transportation options, and just an overall better life in the Capital of the South!! It sounds like you’re happy with your move…and that’s great! It’s always great when people find the place they love and get to enjoy all the things about it. So…why don’t you find a nice “dtatlanta” blog and lurk there? Comments slamming a city on said city’s development blog just reek of insecurity about your decision to leave. Leo works really hard on this site to cover the cool things that are happening in our growing city. Let’s keep it positive! @ Will — I’m not “lurking” on this blog. I actually like to read positive changes in the city since I grew up there. Maybe you should read some of the comments of the people I was responding to who bashed where I live. Is that positive? Or is it ok to bash other areas as long as it’s not Raleigh? I’m sorry to all the people here that have their undies in a bunch because I said that Raleigh will probably not have another tall (30 or more stories) building anytime soon. Sorry if I told the truth about only two skyline changing buildings being built in downtown Raleigh since 1991. I’m sorry if I said people shouldn’t expect anything more than 10-15 stories in downtown Raleigh because outside of the Skyhouse apartment building that’s what Raleigh has been getting. Bryan, to each his own. Please refrain from the overly sarcastic superiority complex that you believe you deserve because you left one city for another. There are awesome things about every location, and every decision of location comes with opportunity costs. Most people’s identity and self worth is based on things like community, faith, hobbies, family…. not the city they live. I have lived in both Atlanta and Raleigh. They are completely different cities. Makes no sense to compare them, including their skylines. Both cities have positives and negatives. As far as downtown Raleigh’s skyline is concerned, I believe within the next 10 to 15 years, we’ll see an iconic 550-600 ft building. Add that to a dozen or so 250-350 ft structures. Raleigh will have a nice (appropriate) skyline for a mid sized city, all while keeping its charm and increasing its street level livability. It would be a mistake for Raleigh to strive for unbridled growth, trying to become a new version of Atlanta. Bryan. Your posts reek of insecurity. What dose what you make have to do with anything. Besides it’s kinda weird for a native to totally belittle his home. Anyway Raleigh is Raleigh and Atlanta is Atlanta. One last thing though. Next time you’re stuck in traffic on Saturday or Sunday. Dream of sleepy little RNC. @bryan……it’s just dumb that we interpreted what you said about moving to Atlanta for more tall buildings?…………..”The fact remains there isn’t going to ever be any real high rise construction nor will Raleigh grow to be this great city that everyone keeps talking about. A nice place to live, yes but that’s it. That’s why I left and went to a REAL city in Atlanta. Atlanta has completed 5-6 buildings over 20 stories in the last year plus there are about 10 under construction now.”. Those are your words not mine. And don’t get mad at me. I don’t create all these Business Insider, Forbes, etc lists that list Raleigh as a top 5 city in America to live with Atlanta nowhere to be found. This blog is for people who love this city and are interested in keeping up with what’s going on in our downtown. I would imagine most of us here have no interest in living in Atlanta or we would likely live there already. Like the previous poster suggested…..go find the dtatlanta.com blog. Reading back through these comments, I remembered that I wanted to comment about Raleigh @ 700,000. To get there by the 2030s, Raleigh would have to add well over 10,000 ppl per year for the next 20+ years and/or find a way to annex residents that exist in the city’s ETJ. I think that Raleigh’s ETJ maxes the city’s possible land area to around 200 square miles but that’s not going to be easy to do since one of the first things that the Republicans did when they seized power at the state level was to limit a city’s ability to grow over the objections of existing non-city land owners. @700,000 and with our current land area around 145 square miles, the city would have to attain an average density of nearly 5000 ppl/sm. That a tall order for a city that’s a bit over 3100 ppl/sm now. With increased density in key areas of the city that have already been identified (Downtown, Crabtree, Brier Creek, Capital Blvd @540, etc. ), I can imagine the city adding 600 ppl/sm in each of the next two decades but continuous density growth is going to be difficult without some serious re-thinking our land use policies and transportation networks beyond the car. That all said, I think that a 600,000-625,000 range in the next 20+ years is more attainable than 700,000. By then I think we will also see Cary over 200,000, Apex approaching 100,000 and Holly Springs and Wake Forest over 50,000 each. The wildcard in all of this is what happens with the annexation laws in the future. There are some significant swaths of unincorporated developable land that could add tens of thousands of residents to many Wake Co. municipalities in the future. @Brian: Please feel welcome to hang around and keep up on what’s happening in downtown Raleigh. And if you want to compare Atlanta with Raleigh, I have no problem with that. Don’t let some of the others here cop an attitude and ask you to leave. It’s an open forum. Just be careful not to confuse quantity with quality. I’ve run into that judgement error from Atlanta business people that I’ve worked with in the past. That confusion could lead you to believe that Atlanta is a better place to live than Raleigh, when actually it’s not. Yes, Raleigh is a smaller city. It’s a place where you won’t get lost in the crowd. A place where you matter – you can personally make a difference. A place where three large universities exert a greater impact on the population-at-large than happens in other small to mid-size cities, and they also help produce a flow of ethnic and cultural diversity, with all of its benefits. It’s a place where the science, art, culture, and political scene is well-developed, but still very open to your own ideas and participation. It’s a downtown where the buildings aren’t as tall, but where “missing teeth” in the streetscape are quickly filling in, creating a more vibrant street-level experience. It’s safe, compact, walkable, full of weekend concerts and festivals, and soon to have a much improved public transit system. Jobs are plentiful, and the cost of living is low. The beach is 100 miles down I-40, so bring your flounder gigging spear, your beach blanket and sun umbrella, your boogie board, SUP board, or kayak. Washington DC, with its Smithsonian museums and Library of Congress (largest library in the world) is just a quick plane, train, or car drive to the north. What does Atlanta have that we need in Raleigh? I would say not much. And really, Brian, we both know you come here to “dtraleigh” because you’re just a little bit homesick. Come on home, my friend! Your unique qualities will always be welcome here. But when you whine about boredom and the need for big city Atlanta, realize you’ll often be talking with someone who chose to come here from Boston, New York, Philadelphia, or Washington just to be part of our scene. That would include me! Nobody asked Bryan to leave. A few pointed out his trolling. A few engaged and refuted his premise. I believe this new hotel, regardless of plain architecture, will be a positive for the city. 259 rooms, baby! Obviously, we’re not going to agree on the skyline issue. It would certainly take a long time for the Triangle to match Metro Atlanta in 2017 population (and obviously, Metro Atlanta is still growing rather rapidly). Here’s an interesting note, the CITY of Raleigh has actually about the same population as the CITY of Atlanta. The METRO region in Atlanta is the difference, (5 million v 2 million). Point is, even if the urban core is similar, the metro area makes a big difference. The two cities I mentioned, Minneapolis and Denver, both have larger metros than the Triangle, but the Triangle is quickly approaching their current size. The region is expected to have over 3 million people by 2030. I’d be very surprised if the skyline lacks an “real” skyscrapers by then. But, who knows? That was probably my comment. I think you make some valid points, perhaps the city will not have that level (700,000) by then, but the Metro (the Triangle, and yes I know technically Durham has its metro) is projected to grow by 70% over the next 20 years (according to the Carolina Demographic Center) so I applied that number to the city, without accounting for the density issues you mentioned. Regardless, as I said above, even if the city has limits to its overall growth, the metro will continue to grow very rapidly, and that’s what really matters anyway. Indianapolis and Columbus are both more populous than Boston or DC, but everybody knows Boston and DC are much larger urban centers, because the metros are much larger. Thanks @Leo for an outstanding job of guiding the ship, and keeping the subject matter relevant thru 2016. And thanks to all of the regular and occasional posters – this site is full of good ideas and never dull. Keep it up and have a great 2017! This is a Great Site ! I Love It ! It looks very strong that 2017 is going to be a great year for downtown Raleigh ! With all the projects that Leo has mention & any new projects , Raleigh will be a Great Mid- Sized , Small Big City , I think ! Leo , What in the world would we do without You & this Site ! Thanks So Much ! I’m sorry, did I come back from the weekend to a blog full of 12 year olds? Back to the worthwhile discussions, please. Not too happy to see this kind of negativity from ANYONE, sorry Leo. Happy New Year. I enjoy reading Raleigh blogs. I appreciate Raleigh for what it is. As a New Yorker, it’s funny reading about someone from Atlanta go on about why Atlanta is better than Raleigh when I can easily look at Atlanta as if it were Raleigh or Durham. See each city as it is and celebrate them. As a whole Raleigh is growing at a healthy pace and will have longevity. I’m happy for downtown, North Hills, Crabtree and Brier Creek. I’ve met the team representing Kane Realty when they visited NYC years ago to meet with the developers of Bryant Park as they wanted advice and to create a park in midtown as well that serves multi-purposes. This was before the east side of North Hills existed as it is today. Raleigh is on the right track!!! Thanks NYC ! ” Happy New Year ” ! NYC you have the right idea, as far as i’m concerned. I moved 8 years ago from MA/NY with the entire world in my consideration. Obviously I’m biased as an American, but Raleigh seemed to me a perfect mix of up-and-coming, manageable, a real city, affordable, good weather, good location, and fun. I always wish the growth was a little faster and sometimes think Austin would’ve been a better fit. I’ve never wanted to live in Atlanta or Charlotte, much less Boston or NYC where i’ve actually spent a lot of time. If I moved from Raleigh, it would probably be to Austin, Vancouver, or Sydney (for various reasons). It makes me laugh to see someone trying so hard to say Atlanta is so much better than Raleigh. It’s not like anyone is forced to live here; we like this pace of life! That being said, I love visiting a lot of cities and am always so happy when there’s new buildings, restaurants, entertainment, etc. Great comments guys! DT Raleigh IS growing, gradually, and I’m enjoying watching buildings pop up one at a time (Skyhouse, Charter South, Dillon, Residence Inn). Perhaps in 2017 we’ll see Charter North, Hilton, One Glenwood and 301 Hillsborough started. I’m still hoping the city will build something at least 20 stories on the old PD lot to help tie all together. Wow, this blog was live hahahaha…ya the guy comparing Raleigh to ATL just sounded silly because there are no comparisons…As previous people have said Raleigh has its perks, as well as ATL…coming from Newark, NJ, Raleigh is a breath of fresh air…and honestly N.C. was the furthest south I wanted to live…ATL, GA is a little far south for me…lol…GREAT BLOG, and I agree let’s continue to keep it positive. I have said this before.. and I’ll say it again. I think a HUGE game changer for Raleigh would be a water feature. And we have a hidden one already in place. If they would turn that into a beautiful water feature.. it would completely transform what we see today! Got a little carried away earlier. Oops. I read that as insulting our city rather than useful insight.